I had nothing in my fridge: no lettuce, no meat, no cooked quinoa (I usually keep a container of this in my fridge). I was in a bind; I had to go to work in an hour and I had nothing for lunch. So I started throwing random things together. I wanted to make a salad, but how was I going to pull this off without lettuce? 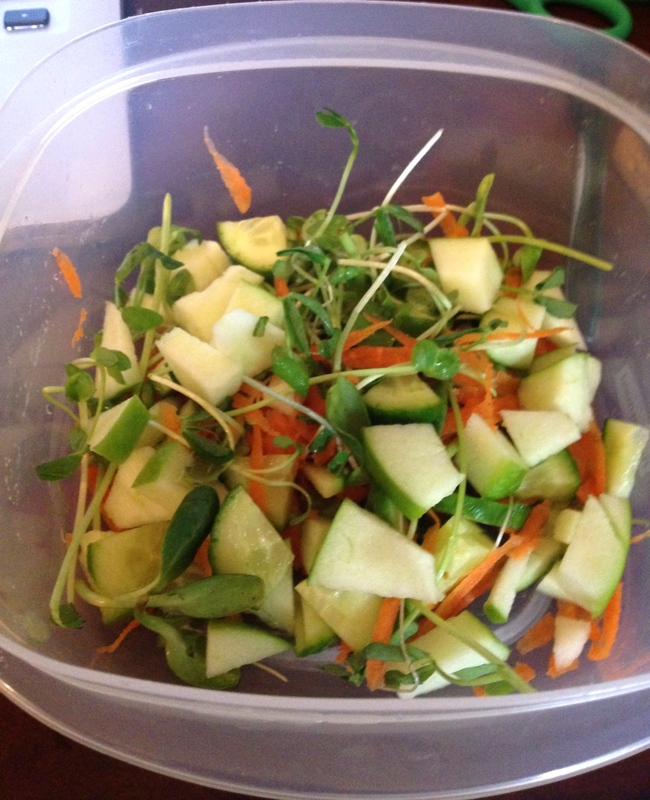 First, I found a container of salad shoots. There was only a small handful of the little sprouts left. Carrots. I had carrots, so I grated one and tossed it in with some diced cucumber. What else could I throw in? I found a green apple. “Ok, this might taste a little weird,” I thought, but I threw it in anyway. 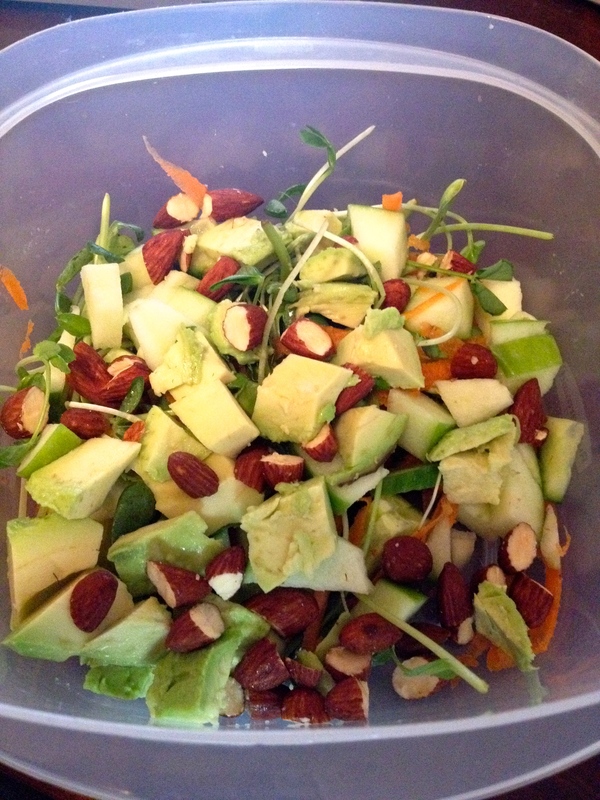 I saw I had a half of an avocado left, so I sliced that up, and chopped some Tamari almonds that I usually eat for snacks. It’s no secret how much I love cheese (I named my dog after cheese, remember), so last I added a sprinkle of feta. I really had no idea how it would taste. At lunch, I discovered I had accidentally made something very delicious! The crispy sweetness of the apple was contrasted by the saltiness of the fresh feta. 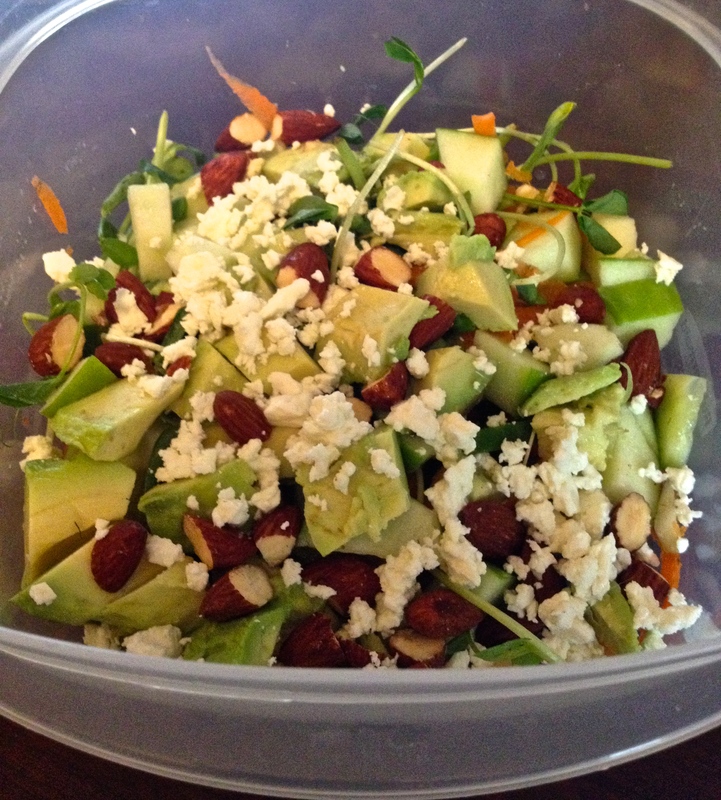 The crunch of the almonds added delightful balance and the avocado, a smooth rich texture. It reminded me not to get so hung up on recipes. Sometimes our best dishes come out of the inspiration of our imagination. Trust your intuitive cooking instincts! Have you whipped up any ‘what I had in my fridge’ dishes lately?